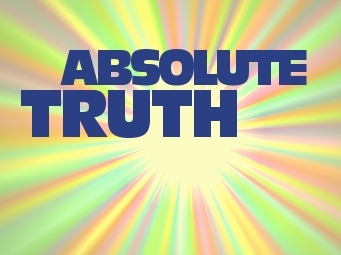 Absolute Truth refers to a reality which doesn't change over time. Absolute means all other truths are relative to it, or depend on it. When we talk about God, or Krishna, we're talking about the Absolute Truth. The Absolute Truth is the source of everything, the ultimate cause of all causes. In Sanskrit, it is also called satyam param, the highest truth. This supreme truth can be perceived in three features—as Brahman, all-pervading, impersonal oneness, as Paramatma, the manifestation of God within the heart of every being, and as Bhagavan, the Supreme Personality of Godhead. These three are the same one truth, understood from increasingly advanced levels of realization. In the beginning the Absolute appears impersonal. With more advancement, the Supreme is perceived within one's own heart and the hearts of others. The highest realization is to see the Supreme Truth as the Supreme Person, who is complete in wealth, power, fame, beauty, knowledge, and renunciation. The Bhagavad-gita, the Srimad-Bhagavatam, and other Vedic literatures identify this Supreme Personality of Godhead as Krishna. - why the conception of God and the conception of Absolute Truth are not on the same level. - what's true today may not be true tomorrow, but some things are always true. - the Absolute Truth contains everything, everyone, and even personally answers our prayers. "Learned transcendentalists who know the Absolute Truth call this nondual substance Brahman, Paramatma or Bhagavan." "The Absolute Truth is both subject and object, and there is no qualitative difference there. Therefore, Brahman, Paramatma and Bhagavan are qualitatively one and the same. The same substance is realized as impersonal Brahman by the students of the Upanishads, as localized Paramatma by the Hiranyagarbhas or the yogis, and as Bhagavan by the devotees. In other words, Bhagavan, or the Personality of Godhead, is the last word of the Absolute Truth." "In the relative world the knower is different from the known, but in the Absolute Truth both the knower and the known are one and the same thing. In the relative world the knower is the living spirit or superior energy, whereas the known is inert matter or inferior energy. Therefore, there is a duality of inferior and superior energy, whereas in the absolute realm both the knower and the known are of the same superior energy." "I meditate upon Lord Sri Krishna because He is the Absolute Truth and the primeval cause of all causes of the creation, sustenance and destruction of the manifested universes." Doesn't each person have his own truth? How do you know the books you base your truth on are true themselves, and not fiction?